This is a book on the person best known as a painter from Florence; Leonardo da Vinci. The book is from Hourly History series; where a short summary / biography is written about the subject covered and this book too; seeks to achieve the objective of imparting the knowledge to the reader in an hour. The book starts by describing about Leonardo da Vinci's humble origins considering that he was an illegitimate child back in the medieval times and how he never had formal education. It then focused on how da Vinci excelled during his apprenticeship with various famous painters and how he eventually started creating masterpieces revered by all. 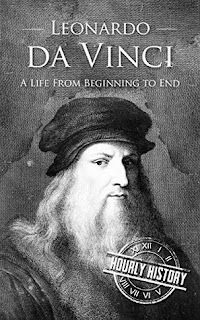 After his life as a painter, the book starts focusing on the less known aspects of da Vinci such as his contributions to science, be it in anatomy or in optics and how his journal containing all his observations helped in a lot of future observations. I too, didn't know much about da Vinci before reading the book; I had the knowledge that most would have; that da Vinci was a famous painter who painted the Mona Lisa and The Last Supper. It gave me good insight into da Vinci's contributions to science and yes; it also tells us as to how a lot of things could be learnt by mere observation and subsequently thinking and analysing the subject. However, I would have liked it more if the book had touched upon a little more on how scientists in future used his hypotheses (I agree, the book did mention about the bridge in Norway from Oslo to Bergen) considering, this is the shortest Hourly History book I have read so far where it took me just under half an hour to complete the book. On the whole, I would say that I knew a lot more after spending the time on this book than before and I would award the book a seven on ten.